You must never underestimate the importance of keeping in touch with your business contacts. The easiest and least expensive customers come from repeat business and referrals. Did you know that the cost of acquiring a new customer is ten times more than retaining or re-engaging a previous or existing customer. Many small business owners and professionals spend too much time chasing cold prospects instead of looking after the contacts that they already have! 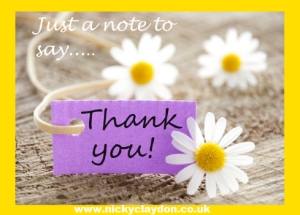 It doesn’t take much effort, at all, to send one note a year just to say “thank you” for being a valued customer, but this can often get overlooked. To keep in touch it is imperative to have a good follow-up system in place which can include one or all of the methods described below. These are effective when used properly but there can be some drawbacks….. Calling all your customers can be extremely time-consuming and sometimes frustrating as it is often difficult to get hold of people. This is sometimes made more difficult by the receiver of the call viewing it as an intrusion or interruption if they don’t need your particular service, at the time of the call, which can often be deflating. Due to people’s e-mail boxes being flooded on a daily basis, e-mail is increasingly unopened, and it can be at the mercy of spam filters. It is also often ineffective due to its impersonal nature. Did you know that over 80% of e-mail is deleted without being read? Unless you know that someone prefers this method of communication, it is not good to rely on only e-mail for your marketing follow-up plan. Did you know that the average person receives 41 lbs of junk mail per year (approx. 560 pieces) and 85% of mail received today is unsolicited? More often than not it isn’t personalised and feels like it was sent out en masse. The response rate is extremely low, however, if it is personalised response rates increase hugely. Like direct mail, text messages are often sent out en masse and can feel very impersonal. Unless it is done in a personal way, texts can often go ignored. Unless you have ascertained, early on when dealing with a customer, that this is their preferred method of communication I, personally, would not recommend this as a long-term follow-up strategy. To make it even easier for yourself, when you start your relationship with a new prospect simply ask them the question of how they would prefer you to stay in touch with them, i.e. phone, e-mail, text or post. Then, from the start of your working relationship with them, you already know the best way of keeping in contact with them in order to ensure you stay in touch. The first process in Relationship Marketing is to develop a personal touch. Without this you are not going to get any further! Developing a personal touch requires you to have gratitude for the customers you already have and to express that gratitude through the use of appreciative words ON A REGULAR BASIS. Once you see the true value of appreciating your customers, you need to get to know them. Start by ensuring you have a database with all your customers’ information on which you can access, at any time, either virtually or physically. You then need to ensure you get to know something about each customer that you can document in your database. This could be their partner’s first name, how many children they have and their names, a favourite product that they simply can’t live without or a holiday they were due to take. By taking the time to find out this type of personal information, you are building a relationship with the customer which is something that many of your competitors will be overlooking to do. When you have this information ensure that you make a note of it in your database, straight away, so it isn’t forgotten. Then there are a number of ways that you can use it in the future when contacting them. For example, it is really powerful when, at a future meeting, you can ask after their partner including the use of their partner’s first name – this is something that will always impress. Finally, you need to implement a strategy to decide when and how you want to follow-up with these business contacts, to show that you appreciate them more than just a paying client. Remember the key to Relationship Marketing is to add that personal touch. It isn’t the time to showcase your latest product. However, it is the time to show how much you value their custom and that you care about them, without any other agenda. You may choose to send New Year’s cards rather than Christmas cards. You may also elect to send a card on their birthday or the anniversary of them becoming your customer. You may also choose to send them a card when they have reached a certain milestone within their own business, to show your care. Alternatively, you might send a note just to simply say ‘thank you’ for being a valued customer. Once you have planned how often you are going to keep in touch, select the means by which you are going to use to follow-up. My chosen method is to use greeting cards, but you may choose an alternative method. Whatever, you choose, you must put a system in place to ensure this happens on a regular basis. I hope this post has got you thinking about your current strategy and if it needs improvement. If I can be of any help please do get in touch or comment below. 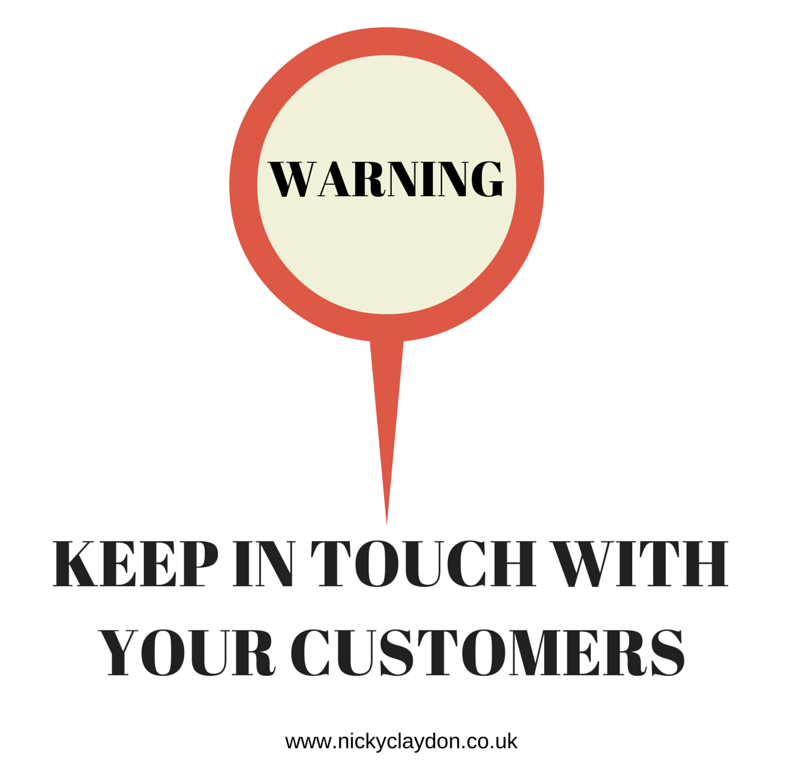 For every month your business is not in contact with your customers you will lose 10% of your influence over them. 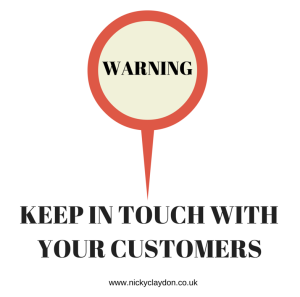 Do you keep telling yourself that you really need to get in touch with your customers? Are there people connected to your business that you are neglecting? Do you need to remind these business contacts that you are STILL IN BUSINESS! So why do your customers leave you? It probably isn’t what you think! The US Small Business and US Chamber of Commerce researched this subject and their findings were extremely interesting. Do you ever ask yourself what will happen if you don’t keep in contact with your clients on a regular basis? It is simple – they will go elsewhere! Customers who feel appreciated provide more referrals, which costs you absolutely nothing in advertising costs. Customers who champion you, and the service that you provide, can furnish you with as much as 80% more referrals per year. Losing customers, or customers who will recommend your services, is completely unnecessary and you don’t want this happening to you. STOP THE ROT NOW to ensure your customers hear from you so that they don’t get forgotten! Focus on building better relationships with your current or past customers in order to have an endless stream of repeat and referred business. I have no follow-up system at all and don’t know where to begin? The current system I have is costly, labour intensive and takes-up a lot of my time? The current follow-up method(s) I’m using doesn’t/do not produce the required results and, if not, is it time to replace it/them with an alternative? Which one applies to you? Now is the perfect time to get yourself organised. Don’t delay and with a little help you will be able to put a simple operating system in place – you’ll be pleased you did! So what is Relationship Marketing? Relationship Marketing is a relatively unknown concept for most small businesses owners/sales professionals or, if people are aware of it, the meaning is often completely misconstrued, so what is Relationship Marketing? Relationship marketing is a strategy used in business to foster customer loyalty and also emphasises customer retention and satisfaction rather than focussing on sales only. 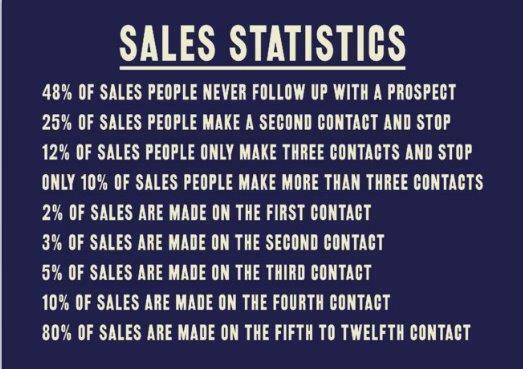 It is most often used by small businesses and sales and marketing professionals who realise the importance of really connecting with their prospects/clients and the benefits for their business, over the longer term, by doing so. When in business it is all too easy to focus on your marketing generally rather than honing in on specific aspects of marketing to help grow your business. There are also many small business owners who shy away from any form of marketing altogether as they view marketing as an expensive commodity that they can ill afford. If this is you, this could really be doing your business a disservice. Businesses owners, generally, are all too often more than happy to ‘shell out’ for an expensive website but then overlook that the fact that they need to market their website in order to gain business as people will not magically find their website unless it is at the top of Google’s search engine. Many businesses aren’t aware that just through communicating more effectively on a regular basis with their existing contacts and customers, they can reap the rewards of more business and referrals just by implementing a simple system, without having to go out and look for new customers. This can be done relatively cheaply too. As a practise, relationship marketing differs from other forms of marketing in that it recognises the long-term value of customer relationships and extends far beyond just a one-off sale. The main reasons businesses are often not committed to relationship marketing is due to: a lack of resources, not having a clearly defined strategy and not having a simple system to keep in touch effectively. Loyal customers are extremely important to any business as referrals are free, whereas attracting new customers is a much more costly process. In today’s technological age it is more important than ever to develop and maintain a good relationship with your customers, clients or prospects. E-mails often remain unopened or aren’t even received due to spam filters. Phone calls and text messages are easily forgotten or ignored. However, a greeting card or postcard is often kept or passed on if it includes a personal message and includes your business details discreetly. Many top sales professionals have built their businesses on the strength of their personal relationships with clients, which are built over time through the sending of personal notes. What if you took a picture of a customer or client, their business, product or their staff and turned it into a greeting card? What if you downloaded an image that was quirky and different and would make your contacts smile so that they would remember you and pass your name on? If you sent just a Christmas Card or New Year Card and birthday card twice a year, this in itself would ensure they remember you for as little as £3.60 including postage per client, with the cost being spread evenly throughout the year if you budget for it. Don’t you think this would make you stand-out from your competitors who simply do not do this? If they remember you, it will be you they ring when they next need the type of service/product you provide. Nowadays only 3% of post received is personal, so why not be different and show your business contacts that you care about them and their business and ensure they remember you. 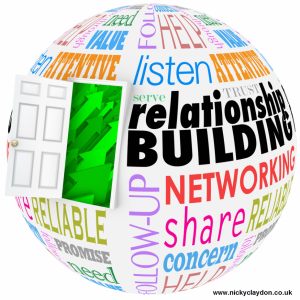 If you would like any help or advice on how to build long-term relationships with your business contacts please connect with me on Facebook, Twitter or LinkedIn. Would also love to hear your comments below if you found value in this post. Whilst promoting my card business over the last year, I have had the privilege of meeting or connecting, via Social Media, with some amazing photographers who work wonders behind the lens. What I love about them all is that they each have their own unique style and specialisms.